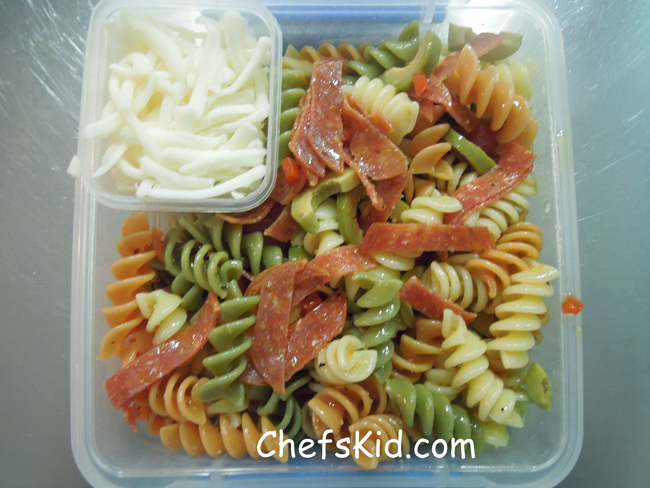 If your Kid loves pizza as much as mine, Pizza Pasta Salad could be their new favorite thing! Basically, instead of crust, we have pasta. Turns out Kid doesn’t love Italian dressing, so we added a little pizza sauce to the dressing for our next version (not pictured) and that went over much better. But he did like it well enough to eat more than half, which in my book is great for something he claims not to like. Kid also doesn’t always like cheese in stuff, so we try to put it on the side whenever possible. He does love green olives and pepperoni, so those we added liberally. And that’s really all there is to it. You can experiment with different pastas – whole grain, whole grain blends, different shapes, etc. to find the combo that works best for your Kid. We do that all the time to present familiar flavors in a new way. One thing that’s great about this dish is that whenever we have to bring a potluck dish, we can bring this and know that our son will have something he likes to eat. But be forewarned, it’s a crowd-pleaser so either make a big batch, or bring Kid his own private container of it so he gets enough.